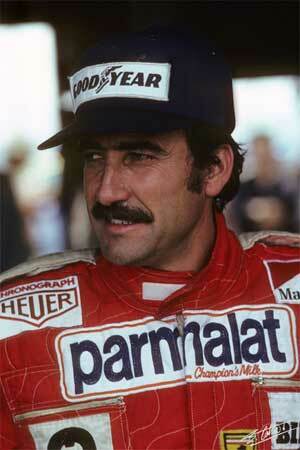 Gianclaudio "Clay" Regazzoni was born in Lugano, Switzerland, a few days after the outbreak of World War II. He grew up in province of Ticino, the Italian-speaking region of Switzerland, and began racing in the mid-1960s, first making an impact driving for the De Tomaso company and then joining Tecno in 1967. The following year Regazzoni was a regular race winner while also racing in Formula 2 and being involved in the accident at Zandvoort which killed Chris Lambert. In 1970 he finally made the breakthrough and won the European Formula 2 Championship for Tecno. In the early races of the 1970 F1 season Ferrari ran only one car for Jacky Ickx but then decided to try out some youngsters. After giving Ignazio Giunti a run in Belgium (where he finished fourth), the team ran Regazzoni in Holland. Clay finished fourth on his F1 debut, won the Italian GP later in the season and ended the year third in the World Championship. That winter Giunti was killed in a sports car accident in Buenos Aires and so Ferrari settled on Ickx and Regazzoni in 1971. The car was not a great success and at the end of 1972 Regazzoni decided to move to BRM where his team mate was Niki Lauda. 1973 was not a very successful year but at the end of the season there was a big shake-up at Ferrari after Luca di Montezemolo was hired to run the team. Mauro Forghieri was put back in charge of technical matters and the team hired both Lauda and Regazzoni for 1974. Lauda became the team leader but Regazzoni was never far behind and won the German GP that year and followed up in 1975 with wins in the non-championship Swiss GP at Dijon and the Italian GP. In 1976 he won at Long Beach but his star faded that year and by the end of the year Ferrari had hired Carlos Reutemann to replace him. He moved to Ensign in 1977 and then to Shadow in 1978. His career was on the slide when in 1979 he was picked up by Frank Williams to drive alongside Alan Jones. As luck would have it, Regazzoni won the British GP after Jones retired to give the team its first F1 victory. Clay was past his best and in 1980 Williams dropped him to make way for Reutemann and he went back to Ensign, which was undergoing a revival thanks to Unipart money. At Long Beach he suffered a brake failure at the end of the long straight and went off, crashing into Ricardo Zunino's abandoned Brabham, which launched the car into the air. It flew into a concrete barrier and Regazzoni suffered spinal injuries which resulted in paralysis below the waist. A Los Angeles court later rejected a $20m damages claim against the organisers of the event. Regazzoni refused to give up and in the late 1980s began competing in hand-controlled vehicles on the Paris-Dakar Rally. In 1993 he competed in a hand-controlled car in the Sebring 12 Hours although three years later he was refused an FIA international licence to race in the World Sportscar Championship. In the 1990s he was a regular F1 commentator with Italian TV and he went on competing until 2000 when he took part in the London-Sydney Marathon Rally in a specially-modified 6.3-litre Mercedes at the age of 61.